Description: When the #928 Little People Fire Station set was discontinued in 1982, the truck used in the #928 was slightly modified with designs on the sides and introduced in 1983 with the Little Trucks Fire Engine Rig. This set also uses #928's 2 yellow stabilizers that attach to the sides of the truck. The stabilizers prevent the truck from tipping over when the ladder is extended and turned to the side. This set also uses 2 exclusive fireman...firemen with silver hats! These exclusives were later replaced with more common firemen. Though the firemen were exclusive, they still do not win as this set's "Most Hard to Find" piece. The most hard to find pieces are the 2 yellow stabilizers. Eventhough they were sold from 1980-1982 in the #928, and sold until 1990 with this set, they are such oddly-shaped pieces that most children never found a use for them and soon threw them into the trash. FPT540 - Red top, white bottom fire truck with a white ladder base in the center. The ladder base swivels and holds the 3-piece ladder extension (SEPERATE PIECES). The fire truck has a GOLD DESIGN on the cab door. Marked "MADE IN THE USA" on the bottom. FPT751 - White 6 rung ladder BASE piece. FPT752 - White 6-rung ladder MIDDLE EXTENSION piece. FPT753 - White 7-rung ladder with EXTENSION-WITH-BUCKET. 2 each - FPT717 - Yellow hard plastic vehicle support/stabilizer. The stabilizer is almost rectangular (one corner rounded). The stabilizer serves as the anti-tip-over devices for the long plastic firetrucks. 2 each - HPP - All-Plastic Original Little People firemen. Both fireman have a short black body, silver firemen helmets, and white arms and collars. Their arms were designed to hold fire hoses, but this set was not sold with a fire hose. FPT811 - Red top, white bottom fire truck with a white ladder base in the center. The ladder base swivels and holds the 3-piece ladder extension (SEPERATE PIECES). The fire truck has a GOLD DESIGN on the cab door. Marked "MADE IN THE USA" on the bottom, but factory scratched over it when made outside the USA. KQPP - This set could have also used a black body fireman with a silver fireman helmet and red arms and collar. 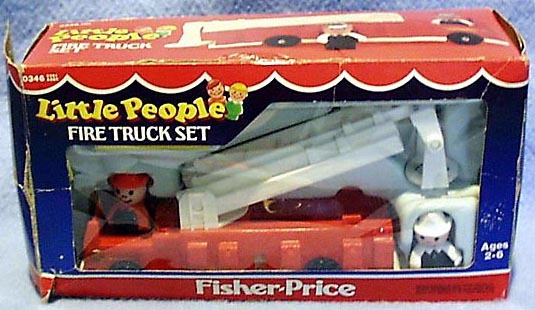 1985 Fisher-Price dealer catalogue - FPP - Both fireman used in the set have black bodies, red firemen helmets, and red arms and collar. FPP - Fireman with a black body has a red fireman helmet and red arms and collar. IPP - Fireman with a black body has a white fireman helmet and white arms and collar. 1985-1990 - This set was also sold in #2351 Little People Mini-Sets Assortment.